This weekend, an estimated 35,000 designers, manufacturers, retailers, and press descended on Chicago's McCormick Place Convention Center to see the latest, greatest, and greenest in kitchen and bathroom products, fixtures, and appliances at the Kitchen and Bath Industry Show (KBIS). Dwell's associate editor Miyoko Ohtake toured the floors and made the following finds. 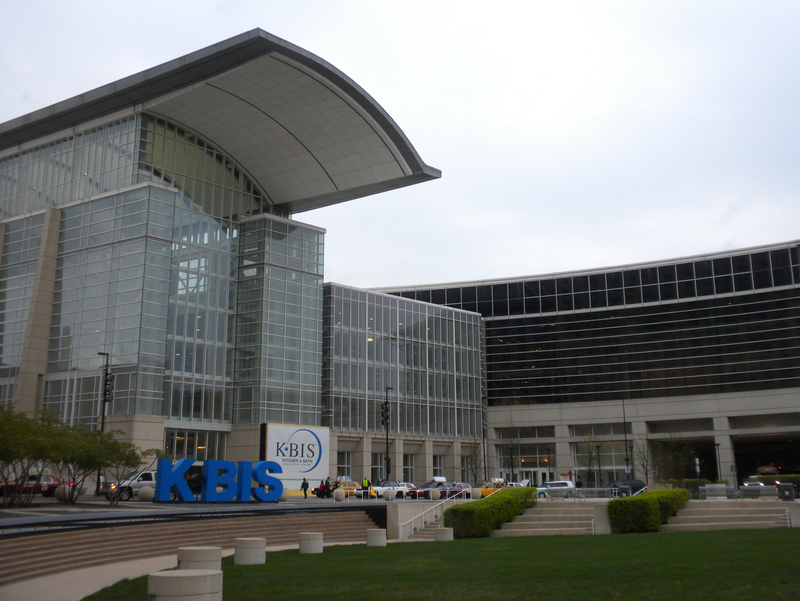 The annual Kitchen and Bath Industry Show (KBIS) exhibition was held at this year in Chicago at the McCormick Place Convention Center and kicked off April 16. Inside the convention center, an estimated 35,000 attendees filled the North and South halls. Delta had an ample display of its best-known products, faucets, on the show floor but was also highlighting universal design in its collection. One of Delta's universal design-minded bathrooms featured sleekly crafted handrails, an adjustable-height shower head, and a fold-down seat. Moen also showed off its faucet lines. Hanwha, creator of HanStone Quartz and Hanex Solid Surfaces, displayed an innovative use of solid surfaces that become a wrap-around, conch-like shower. Toto had its lineup of low-water toilets on display as well as its washlets, sinks, and faucets. In Blanco's collection was a new sink combination that features a built-in composting bucket (left), which could also do double duty as an ice bucket and wine cooler. Another highlight of Blanco's booth was this handcrafted sink and streamlined pull-out faucet. Liebherr's claim on the refrigeration market is its ability to keep food fresh longer. The freezer drawers, rather than wire racks, help keep food cold and reduce the loss of cold air whenever the freezer is opened. Fisher & Paykel, known for their dish drawers, also had on display their new under-counter convection ovens. Lutron displayed its variety of lighting systems and products, from LED dimmers to colorful plug plates. The plates are available in over 24 colors. Lutron's booth also featured its "eco-solutions," such as its occupancy sensors and integrated lighting to promote behavior changes such as keeping the lights on at 80-percent instead of 100-percent illumination, a difference that is not noticeable by the human eye. Kohler introduced a new matching sink and toilet in their artist collection, which feature a light design and gold accents. The all-black Xenon bathroom collection by Samuel Heath stopped many a passerby. GE displayed a new washer and dryer designed to respond to grid demand and peak hours. The appliances will ask you if you can wait until non-peak hours to do your laundry in efforts to reduce demand on the grid and save you money if your utility charges more in peak hours. GE Monogram's ovens, like many new ovens, featured roll-out racks that extend all the way out for easier use. Hansgrohe collaborated with Duravit to create its PuraVida collection of chrome and white chrome fixtures and bathroom furniture. In addition to its eco-line, Cosentino displayed its new Integrity sink that creates a uniform look with the counter and is available in over 80 colors. View our slideshow of KBIS 2010.